Buttoning up your Murphy, NC garden during the fall is like cleaning up after Thanksgiving dinner. On Turkey Day, you just feasted on a tasty 20-pounder with all the fixin’s – and now you must clear the table before scraping and washing the dishes. And when fall catches up with your garden, stop growing your vegetables or flowers, and begin that less-enjoyable cleanup operation. When your garden’s harvest came in, you enjoyed a huge bounty of vegetables from early summer until fall. When you exhausted your recipes, you canned or froze every ripe vegetable that crossed your path. Or, maybe flower gardening is your passion. You carefully prepared your beds, planted seeds and transplants, and watered them daily throughout our bone-dry drought. You weeded often, and you managed to drive off the deer so your plants would have a fighting chance. Finally, your garden exploded with a riot of colors that made all that hard work worthwhile. Now that the growing season’s over, though, it’s time to round up those wilting plants and restore some order to your vegetable plot or flower beds. After all, you want to get a head start on next season’s garden. First, encourage your current garden to keep on giving. If you grew some tasty heirloom vegetables, for example, save and store a good assortment of seeds for the next planting season. Try the same strategy with your colorful annual flowers. Either way, store the seeds in paper envelopes, and stash them in a glass jar in a dry spot indoors. Next, tidy up the garden by picking up fallen vegetables that could rot on the ground. Dispose of dead annuals, and cut back perennials that have finished blooming for the season. By reducing the amount of debris on the ground, pests will be less likely to choose your garden for their winter hibernation spot. Of course, living in the woods means you have an endless supply of leaves, a highly beneficial ingredient of your household compost pile. Rake (or blow) a respectable quantity of leaves, and add them to the pile’s green kitchen scraps. Believe it or not, mixing both types of materials helps to generate compost more quickly. Don’t throw in plants with disease or bug problems, and avoid composting dairy or meat products, as they’re a magnet for rodents. If your property includes an expanse of lawn, give the grass one final mowing for the season. Gather the grass clippings and shredded leaves, and spread them over your flower beds to provide protection during the upcoming cold weather. If you’re an avid vegetable gardener, fall is a great time to plant spinach, lettuce, and other cool-season vegetable seeds. If temperatures will dip below freezing, cover your plants with protective straw. Root crops such as rutabagas and carrots will also benefit from a nice straw blanket. Fall is also perfect for planting garlic and shallot bulbs. If your garden didn’t materialize this year, get a jump on next season by planting a fast-growing cover crop. Evenly sow clover, rye, or similar seeds into bare soil. When spring arrives, turn the cover crop plants into the soil, adding essential nutrients your vegetables will love. Plant colorful cool-season flowers such as mums and pansies, and add some ornamental kale for extra greenery. Chances are, these hardy plants will even survive most frosts. Choose an enticing assortment of spring-blooming bulbs, designed to bring your Murphy, NC garden alive after months of cold weather. Hyacinth, crocus, daffodil, and tulip bulbs are popular choices. Plant your bulbs per the grower’s directions, button them up for winter, and get ready to enjoy a rainbow of color when you need it most. Visiting a local county fair gives you a chance to slow down and smell the popcorn…and the barbeque, corn dogs, and funnel cakes. At hundreds of county fairs around the United States, you can browse the exhibits, sniff the farm animal aromas, and listen to great regional entertainment with your family. And best of all, you can enjoy these simple pleasures at our Cherokee County Fair in Ranger – just a few miles from Murphy, NC. So put the third weekend in October on your calendar, head to the Mountain Folk Center, and enjoy some Cherokee County Fair fun. Back in 2015, some Cherokee County residents got together, and sparked the idea of resurrecting the county fair. With the county’s history and pride in its agricultural roots, enthusiasm and ideas were flowing thick and fast. 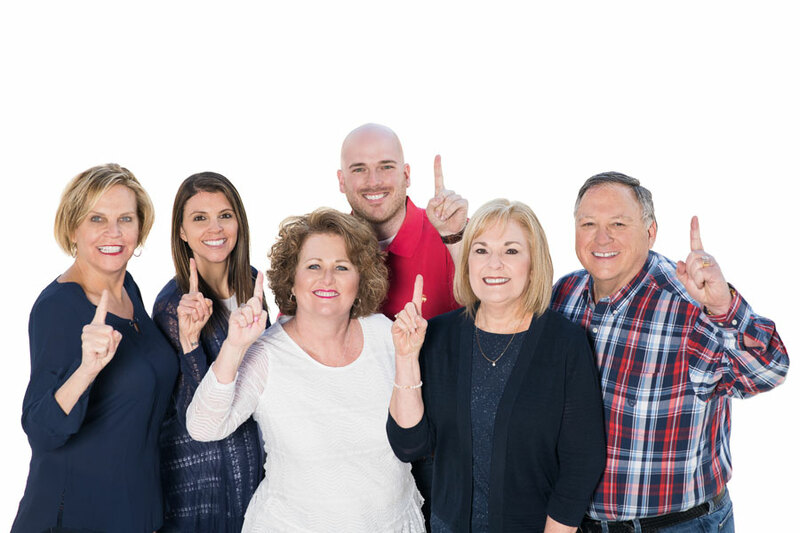 After just a few months’ planning time, and with the support of local officials and the Cherokee County Tourism Development Authority, the Cherokee County Fair made its debut in late October 2015. 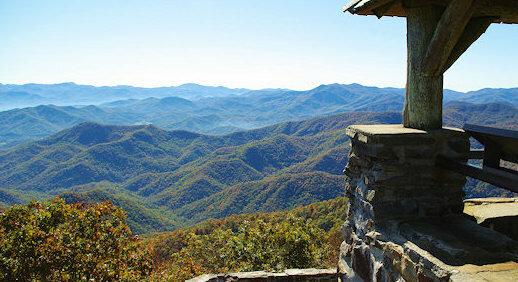 Held at the Mountain Folk Center on US Highway 64 in Ranger, the first-year fair met with considerable success. After planners had time to catch their breath, they quickly began organizing a bigger 2016 event. 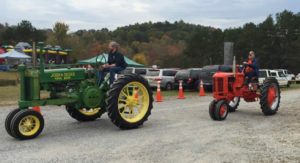 During the weekend of October 21-23, the Mountain Folk Center will again host the Cherokee County Fair festivities. Just 12 miles west of Murphy, this popular spot also houses the summer Farmer’s Market and Nora Starks Memorial Horse Arena. The Fair offers free parking, and a free shuttle van will transport visitors from offsite parking areas. After you arrive at the Cherokee County Fair, refer to your Fair Program for locations of specific attractions. For starters, head to the covered pavilion, where you’ll find a diverse collection of exhibitors. Learn about community groups, view food and craft displays, and browse a growing selection of craft vendors. In other words, there’s something for everybody. Next, head over to the farm animal exhibits, always a hit with the younger set. Kids will also enjoy the bounce house, pony rides, and other kid-focused activities. Don’t miss the pie-eating contest, where competitors of all ages and sizes will chow down on gooey confections at lightning speed. And word has gotten out that this year’s Tractor Parade will include even more vintage and modern machines. You might also see some antique farm equipment. Of course, a county fair wouldn’t be complete without live music and dance performances. Throughout the weekend, a variety of talented regional performers will take the stage. And back by popular demand, the Monroe County Vaulting Team will amaze visitors with their acrobatics on horseback. New for 2016, Alan Kay will teach and demonstrate valuable survival skills. As fans of the History Channel’s “Alone” series already know, Alan won the Season 1 competition for his ability to survive in Vancouver Island’s challenging conditions. You might say Alan’s a pro at making the most of tough situations. Kids of all ages will enjoy the Cherokee County Fair’s exciting midway rides. And of course you’ll be tempted by lots of mouth-watering food. Just follow the enticing smells, and you might be rewarded with barbeque, corn dogs, wraps, and burgers. Of course, we can’t forget sweet treats such as funnel cakes, ice cream, candied apples, and more. In other words, you might want to come hungry. Whether you’re available during the day or evening, you can visit the Cherokee County Fair sometime during the three-day weekend. The fairgrounds are open Friday and Saturday from 10 a.m. to 9 p.m. Sunday hours are 10 a.m. to 2 p.m. Check the Fair’s website below for full admission cost details. Important notes: Plan to pay for your admission, food, purchases, and midway tickets with cash. Leave your pets at home, as they could rile up the livestock or make some Fair-goers nervous. Traveling in a recreational vehicle, or RV, is like taking your studio apartment on the road. You still enjoy all the comforts of home, and you can change your surroundings at the drop of a hat. And when you find a spot you especially like, you can settle down and enjoy it for awhile. Here in Murphy, NC and Cherokee County, we’ve got four nicely outfitted RV parks just waiting for you to pull in and hook up. Each facility’s setting and amenities give it a distinctive appeal. First, check out the Creekside RV Park and Campground, slightly more than two miles east of Murphy on US Highway 19/129/74 (also called the four-lane). Each convenient pull-through site has a Valley River or Rogers Creek setting, and you’ll find stunning mountain views all around. Besides full hook-up services, you’ll enjoy a bath house and laundry facilities, plus wireless Internet so you can catch up with famiy and friends. If you thrive on fishing, try your luck against those wily trout by casting your line right from Creekside’s banks. Finally, take advantage of the pavilion, picnic tables, and fire rings – all great gathering spots to swap stories with other RVers. Contact: Creekside RV Park and Campground, 68 Old Peachtree Road, Marble, NC 28905. 828-837-4123. Also just east of Murphy, you’ll find the Murphy-Peace Valley KOA Campground and Cabins. This versatile riverfront campground caters to both RVers and vacationers, with several full hook-up RV sites and cabins. This award-winning KOA campground offers a well-rounded selection of amenities. Besides laundry and bath house facilities, you’ll find a swimming pool, kids’ playground, and gameroom. Finally, this pet-friendly campground also welcomes your furry family members, so pack extra kibbles and supplies. 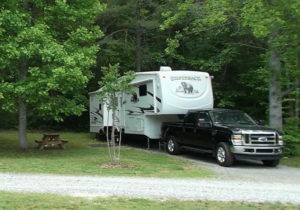 Contact: Murphy-Peace Valley KOA Campground and Cabins, 117 Happy Valley Road, Marble, NC 28905. 828-837-6223. Next, travel west of Murphy to the River’s Edge Mountain RV Resort, featuring direct access off Highway 64 just past the Route 129 intersection. This nicely maintained facility offers Nottley River frontage plus super-wide paved RV sites and adjacent roads. Many sites offer pull-through access, while others provide a waterfront setting. Enjoy River’s Edge’s full electric hook-ups, water, sewer, cable, and wireless high-speed Internet. And speaking of creature comforts, you’ll be delighted with the spotless granite and marble bathrooms, onsite laundry, and comfy computer lounge. 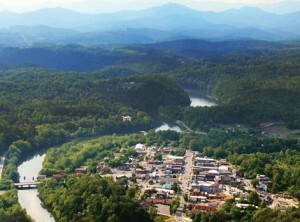 Contact: River’s Edge Mountain RV Resort, 1750 Hilltop Road, Murphy, NC 28906. 828-361-4517. Finally, if you’re itching to park your RV in an absolutely gorgeous waterfront spot, and chat with folks who seem more like family than campground operators, visit charming Persimmon Creek Campground. 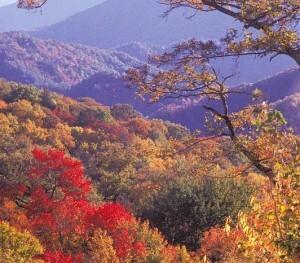 To get there, travel out Highway 64 toward Tennessee. Turn right on Route 294, and then turn left on Sunny Point Road to Persimmon Creek Campground. You’ll access this family-run property via a wide, gradually sloping driveway, and park your RV on a roomy site overlooking a scenic pond. Nearby, you’ll find 1,700 feet of creekfront, perfect for indulging your trout fishing obsession. Persimmon Creek Campground amenities include water/electric hookups, showers and laundry facilities, and free WiFi service. Each wooded site features a picnic table and fire ring, and a horseshoe pit is nearby. For a real taste of home, buy some firewood and free-range pasture eggs. Blueberries, home-grown fruits and vegetables, and shiitake mushrooms will also be available in season. Finally, this pet-friendly campground provides your favorite pooch with many enticing smells, courtesy of the nearby wildlife population. Because Persimmon Creek is just a short drive from Murphy, NC and the Ocoee River, your RV will make a terrific base camp for a wide variety of day trips. Contact: Persimmon Creek Campground, 200 Sunny Point Road, Murphy, NC 28906. 828-644-5800. If you’d like to soak up some good old-fashioned high school football, come on down to Murphy High School on fall Friday nights about 7:30 p.m. Before you hop in the car, dress for the weather, because football games aren’t cancelled for rain, wind, snow, or cold. 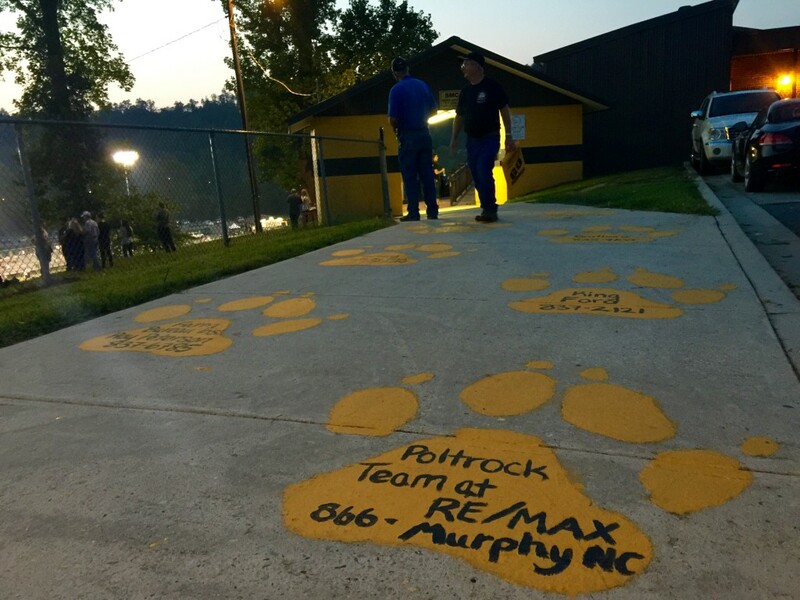 When you arrive in Murphy, NC, head for the Murphy Bulldogs’ stadium – on Bulldog Drive, of course. Park the car (come early if you don’t want to park in the Lowes parking lot! ), grab some refreshments at the concession stand, and stake out a spot in the roomy bleachers. You can even get some really good BBQ sandwiches or fried Oreos at the Band Booster Concession stand! Looking around, you’ll see how important football is to our community. On the playing field fences, notice colorful “Good Luck” banners sponsored by the team’s fans and local businesses. On the way to the stadium, you’ll even see The Poltrock Team at RE/MAX dog paw! The bleachers will also be packed with team members’ families, friends, and fellow students. As the pre-game excitement builds to a fevered pitch, make sure your camera’s ready for action, because you’re likely to see some heart-pounding plays. Also, get ready for some real-life “Friday Night Lights” as the mega-watt floodlights kick on when the sun sinks behind the mountains. Finally, it’s game time – and here come the Murphy Bulldogs, decked out in their black-and-gold uniforms. As they pour down the steps into the stadium, with legendary Coach David Gentry heading the ranks, the team’s cheerleaders crank up the crowd. The opposing team, generally from another regional high school, soon joins the Dogs for the coin toss. Now, let the games begin. When the Bulldogs make an exciting play, or score a touchdown or field goal, watch the cheerleaders whip the fans into a frenzy (and I’m biased because my daughter is a Murphy Cheerleader!). During halftime, these energetic young ladies always put together an impressive routine. Of course, maybe you’re lucky enough to attend the annual Murphy High School Homecoming Game, which falls on October 23 during the 2015 season. After the teams take their halftime break, the Murphy Homecoming Queen and her court literally stop traffic as they parade onto the field. Dressed in colorful ball gowns that would make Scarlett O’Hara jealous, these beautiful young ladies bask in the spotlight while cameras flash and videos roll away. Chances are, they’ll remember this moment for many years to come. If you’re a confirmed North Carolina history buff, downtown Murphy, NC features several noteworthy historical sites, most of them just a stone’s throw from the town’s center square. Let’s say you came downtown for some coffee and pastries from The Daily Grind; or maybe you just finished a tasty lunch at Shoebootie’s. 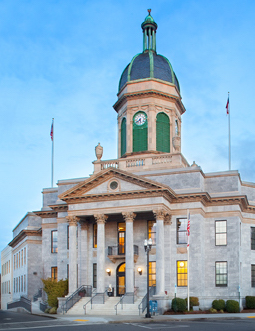 To walk off those calories, and satisfy your appetite for history, stroll up Peachtree Street to the Cherokee County Courthouse. You can’t miss it – just look for the huge marble building on the corner, next to Smoky Mountain Shooters Supply. This Courthouse was built entirely of blue marble from – you guessed it – the nearby Marble community. The current Courthouse opened for business in 1927, after a fire destroyed the supposedly fireproof brick courthouse the year before. If you enjoy tracking down National Register of Historic Places landmarks, the Cherokee County Courthouse has a spot on that coveted list. Just steps from the Courthouse, step into the Cherokee County Historical Museum. Inside this brick building, kids will enjoy shiny minerals and quartz crystals, plus colorful rubies and amethysts. They might also imagine using the early settlers’ tools to accomplish everyday household and farm chores. Of course, the Cherokee Indians have been longtime residents here, on a huge expanse of farmland and forests called the Cherokee Nation. To honor their culture, the Museum showcases over 2,000 Cherokee Indian artifacts. Besides typical household items, you’ll see plenty of pottery, axes, pipes, game stones, and arrowheads. As a side note, nearby Fort Butler served as a collection point for Cherokee Indians made to march on the “Trail of Tears” to Oklahoma. During 1837, over 3,000 Cherokees from North Carolina and Georgia passed through the fort before their long journey west. Look for the memorial monument on nearby Fort Butler Street. Next, take a jaunt to Central and Church Streets, an easy hike in good walking shoes. Here, you’ll find historic Harshaw Chapel and Cemetery, both occupying spots on the National Register of Historic Places. Well-known Murphy resident Joshua Harshaw dedicated this brick chapel to the Methodist Episcopal Church in 1869, although its adjacent cemetery was in operation before that. The Harshaw Chapel was actively used for about 60 years, but deteriorated after the First United Methodist Church was built to accommodate the area’s growing Methodist congregation. In 1965, the Daughters of the American Revolution (Archibald D. Murphey chapter) acquired the chapel, and they’ve maintained it since then. On certain occasions, you’ll find a special Methodist service or community event there. Now, this modest little chapel holds the title of the oldest church building in Cherokee County. If you’re a genealogy fan, check out the Murphy, NC Public Library on Blumenthal Street (near the Courthouse on a side street). Many genealogists sing the praises of our Genealogy Room, containing some of the best resources in western North Carolina (and maybe even the state). While digging through the files, you just might discover a long-lost relative or colorful ancestor.